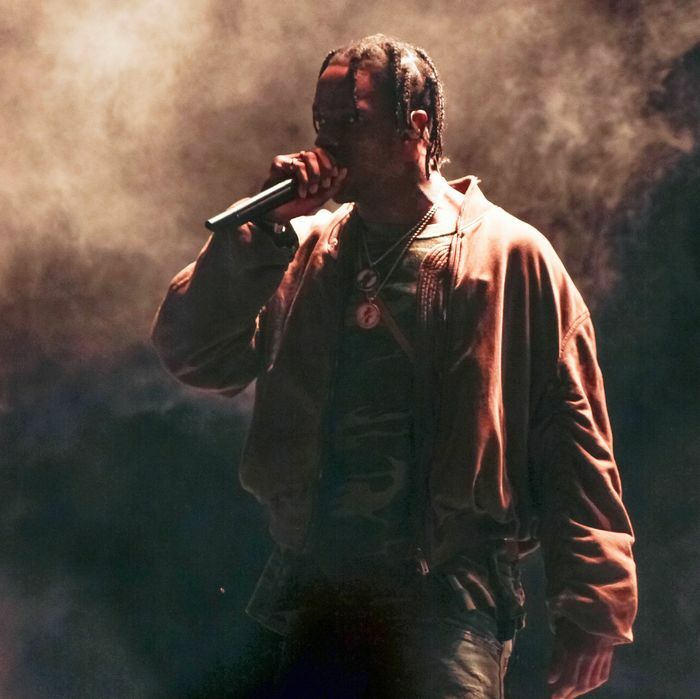 It’s not too surprising that the most important figure on “Watch,” the fresh lead single for Travis Scott’s forthcoming Astroworld, isn’t Scott himself. Scott’s primary talents are trend-spotting and scoping out talent in others: He has a sixth sense for positioning himself alongside more substantial artists in a manner that reflects well on both parties. There are two guests on the new track. The first, Lil Uzi Vert, is proof that his gift for sharp alignment remains fully active. Uzi circles around the titular subject with nimble ease, glancing at expensive timepieces with an appraising eye, zooming in and out with brilliant timing: “Patek Philippe, it cloudy like heaven / Met her at 10, fucked that girl at 11 / Fake diamonds in your Rollie, how you reckon?” By the time his leadoff verse ends, the floor on the track has been raised. Scott’s middle verse is stocked, as ever, with imagistic flexes: Though he doesn’t slouch, it’s clear that Uzi’s illustrious introduction reflects well upon it. The other guest is no young artist whose radiance Scott is content to bask in: instead it’s Kanye West, who more or less invented the lane Scott currently inhabits. West practically wrote the book on using keen curatorial skills to stay relevant by advancing (or at least leaping in front of) nascent styles, and the fact that Scott’s a better reader of the book than West himself hardly means that the former apprentice won’t welcome the master. As they have been for some time, West’s lyrics comprise a jumble of perceptions locked into a semblance of order by the gravity of limitless self-importance. Once again, the world is conspiring to hold back Kanye West’s vision. But the ebullience of his former work has gone: Whether you blame it on the lingering after-effects of the opioid addiction West cites or not, it’s clear that the glazed stare evident in West’s recent public appearances has translated into a delivery so affectless that numb would seem an understatement. He doesn’t even bother to rhyme by the end. The real star, though, on “Watch” isn’t any of the rappers. Pi’erre Bourne, the producer, has crafted a world-class beat that rewards relistening far more than the lyrics laid over it. Bourne’s instrumentals are never less than classy, but here it’s a fashion unto itself: the bulbous 808s and jittery hi-hats of classic trap production are enlivened by intervals of synthetic mists and 22nd-century birdsong while a lo-fi note wiggles back and forth like an Atari centipede. As Kanye West transmutes himself into a geyser of rotten positivity, Bourne’s sounds, in their cheerful insistent futurism, look even healthier in contrast. Similarly, Scott’s Astroworld rollout seems especially polished in contrast to the jagged logic West tosses off hyping his own forthcoming album; we’re looking forward to both albums, but dreading only one.